The Thing and Mr. Fantastic are in the lab at the Baxter Building, watching on a viewscreen Ben curing an earlier version of himself. Reed is showing Ben this to demonstrate his new theory, that Ben did not travel back in time and create an alternate universe when he did that, but rather that he travelled sideways and visited an alternate universe, one which had already existed and which would have continued moving forward in time after Ben left. The alternate world is an apparent disaster area. Buildings are ruined, and nothing is growing anywhere. Ben makes his way out of the powerless Baxter Building to the apocalyptic surface, where he's promptly attacked by a dozen people mistaking the Thing for "one of them". Ben shakes them off easily, and soon meets.. himself. The two adjourn to a subway tunnel, where the alternate Ben tells our Ben his post-Thing life story. He opened his own bar, Spider-man took his position in the FF, and things were going well until Galactus showed up, killed all the superheroes, and sucked the planet dry. The alternate Ben is just mentioning how things were starting to recover, albeit slightly, until they discovered that "he" was back, when the two are suddenly attacked by a swarm of blue synthetic men. The two are separated, and our Ben is overpowered and captured. The alternate Ben rallies the populace of the area to help him recover "our" Thing, while our Ben wakes up to find himself prisoner of... the Red Skull. No Clobberin' Time. We end not with a bang but with a whimper. No Petunia either. Don't they know this was the final double-sized anniversary issue? This story is a direct follow-up to issue 50, which was also written by John Byrne. In 2010, this, together with issue #50, was voted as number 7 / 6 in the "Greatest Thing (Ben Grimm) Stories Ever Told!" poll at Comic Book Resources. Sniff, sniff. Yes, indeed, folks, this is the final issue of the comic book which got your editor started on a life-long love affair with comics, and has me still going strong 25+ years later. Marvel Feature 11 was the first issue, cover-dated September 1973, and MTIO 100 is the final issue, cover-dated June 1983, giving us just shy of a full decade of Thing team-ups. By the by, comic books generally appeared on the stands (at this time) about three months before their cover-date. That would place this one as released in March, 1983 and, based on a date in the book, March 24th, 1983 seems reasonably believable as the official "death-date" for MTIO. The following month (July, 1983) would see the first issue of "The Thing", but after about the first four issues "The Thing" was marginal at best, and I can't really honestly recommend it to anyone but the "true fans". If you do want to read that series, please skip the "Battleplanet" issues, 11-22. Those are amazingly atrociously bad. The rest of the series is readable, at least. "The Thing" was cancelled after issue 36, cover-dated June, 1986. For those fans of the Fantastic Four series reading these pages, the first of these issues (Marvel Feature 11) is listed by the Marvel Chronology Project as taking place immediately after FF 139. The last of these issues (100) takes place just prior to FF 251. The Thing 36 (the last issue of that series) takes place just prior to FF 296. Earth- Galactus Devoured at the Appendix to the Handbook of the Marvel Universe discusses the alternate world seen here in some depth. I rather enjoy the Appendix- it goes into extreme depth on a ton of obscure characters, including several from MTIO. Original art from your editor's collection. Of mild interest here... though its cropped out in this image, in the original art this is identified as being from The Thing, not from Marvel Two-in-One. I don't know if they were thinking ahead or if they'd planned to change the name an issue earlier. 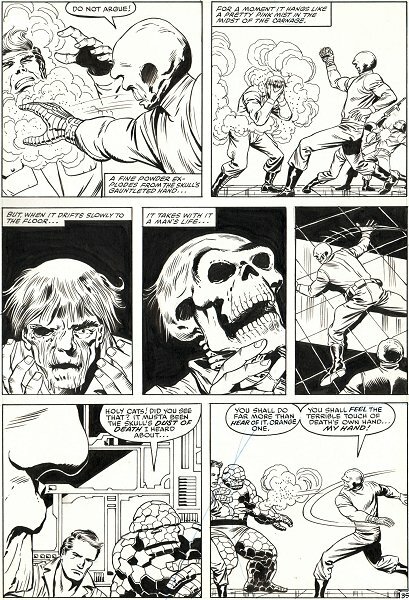 This is from very near the end of the book (page 35 out of 38), as the alternate universal Red Skull is about to meet his doom.